The government must be overthrown, but not everyone understands this correctly. So long as the Provisional Goveminent has the backing of the Soviet of Workers’ Deputies, you cannot ‘simply’ overthrow it. The only way it can and must be overthrown is by winning over the majority of the Soviets. The Government would like to see us make the first imprudent move towards revolutionary action... We cannot say that the majority is with us; what we need in the present situation is caution. To base proletarian tactics on subjective desires means to condemn them to failure. Our organisational apparatus is very weak - our decisions are not being carried out by every one. But these were weaknesses of a proletarian party and reflected the unevenness of consciousness within the proletariat itself. As 1917 wore on, the political fact that the Bolsheviks were the only genuine political force representing the working class became daily more clear. The Provisional Government had come into existence as result of the February Revolution, itself the product of the collapse of the Russian economy after1915. In February real wages had fallen to a third of prewar levels and, despite large nominal increases for some workers, the position was no better in July due to massive inflation. Food prices were doubling approximately every other month during 1917 and the fact that the Provisional Government was even worse at solving the transport question than Tsarism meant that rations of bread were cut from 1lb a day to three quarters of a pound by April. Worse was to come since only 230 rail wagons containing food reached St Petersburg/ Petrograd each day in April 1917 compared with a daily total of 351 a year earlier. Only one third of coal needs were reaching the capital by May and works like Putilov were closed down for weeks on end in August and September. In addition to these temporary closures 568 factories went bankrupt leading to increased unemployment. Not surprisingly even more workers took part in strikes (rising from 35,000 in April to 1.2 million by October). Strikes were a politicising experience for those who took part in them; they saw with their own eyes how employers were going on investment strike, engaging in lockouts,…how the government was colluding with the employers, curbing the factory committees and sending troops to quell disorder … The strikes were important … in making the policies of the Bolshevik party attractive to them. In addition the Provisional Government could not solve the two other desperate problems of Russia in 1917, that of land distribution and that of the war. Even the arrival of the supposed peasant party, the S.R.’s, in the government did little to shake the landowners in the Provisional Government. This was because the S.Rs were sternly patriotic and tried to get the peasants to abandon their land seizures until “after the war”. a voluntary surrender of state power to the bourgeoisie and its Provisional Government. And their political bankruptcy soon showed the Russian workers that there was only one political party which had a programme which defended their interests from the patriotism and abstract “Marxism” of the Mensheviks and S.Rs. At the present moment there is no political party which would say “Give the power into our hands, go away, we will take your place.” There is no such party in Russia. Lenin replied without standing up that there was. (See E.H. Carr, The Bolshevik Revolution, Vol. III.) The rest of the Conference was a tussle between the Bolsheviks to get the other parties to vote for Soviet Power and the overthrow of the Provisional Government. 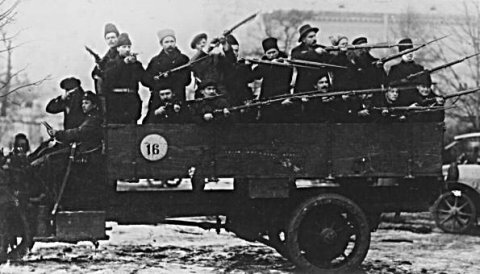 Having failed in the Congress to get the other parties to agree to this declaration of war on the government, the Bolsheviks decided to put it to the masses by calling a demonstration for June 10th. The Soviet Executive denounced it and forced its abandonment (for which Lenin was severely attacked within the Party for vacillating). However, Tsereteli overreached himself when he thought that by calling a massive demonstration in support of the Soviets for the following week this would underline the weakness of the Bolsheviks. This turned out to be a massive misunderstanding of the mood of the Petersburg workers. When the demonstration took place on June 18th only a handful of banners expressed confidence in the Provisional Government (and, by implication, in Soviet support for it), whilst, according to the Menshevik Sukhanov, the slogans on the remainder were 90% Bolshevik. This success was however to bring the Bolshevik Party its severest test of 1917. It used to argued in bourgeois histories of the October Revolution that the July Days were a Bolshevik plot which went wrong (unlike October which, they argue, was a successful coup of the same type). This was one of the main stays in the argument that Russia in 1917 was a power vacuum into which any determined band of gangsters could jump and seize power. However, in the last ten years enough new evidence has been put forward even by bourgeois historians (particularly by A. Rabinowitch in his Prelude to Revolution) to demonstrate that this was not the case. The origins of the July Days lay in the spontaneous revolt of the First Machine Gun Regiment in Petersburg against an order sending them to the front to participate in the Provisional Government’s June Offensive. Instead of trying to prevent a premature outbreak by this single regiment it seems that the Bolshevik Military Organisation, against all party discipline, actually got carried along with the movement. Their paper, Soldatskaia Gazeta, called for the overthrow of the Provisional Government. They also helped to disseminate the news of the First Machine Gunners’ revolt to the working class Vyborg districts and to the naval base at Kronstadt. Here the Bolshevik representatives, Raskolnikov and Roshal, had already been warned by a telephone call from Kamenev to try to dampen down the movement. They were however unsuccessful and were only able to delay the sailors participating in an armed demonstration for a few hours. And when thousands of demonstrating workers arrived at the Bolsheviks’ headquarters in Petersburg on the night of July 3rd both the Bolshevik Military Organisation and the Petersburg Committee agreed to support the demonstration and lead it on the streets. The next day the Kronstadt sailors arrived fully armed at the Bolshevik headquarters. They and the thousands of workers and soldiers with them demanded that Lenin speak to them. Lenin had been absent from the capital for a few days’ rest when he had heard of the new movement. He had only returned a short time before. At first he was reluctant to speak to the demonstration but finally agreed to do so, murmuring to Podvoisky, leader of the Military Organisation, “you ought to be thrashed for this”. His speech was a disappointment to the masses since he only called for a peaceful demonstration and implied that victory would be theirs “one day”. To armed workers, ready to finish off the class enemy there and then, this was incomprehensible. Lenin was criticised then and later for “an absence of leadership” by more impatient elements of the Bolshevik Party. However, to understand his position we must look at the reality of the situation in 1917. Though there can be little doubt that had the Bolsheviks led the demonstration to attack the Provisional Government on July 4th it would have collapsed then. ... in order to gain power seriously (not by Blanquist methods), the proletarian party must fight for influence inside the Soviet, patiently, unswervingly, explaining to the masses from day to day the error of their petty-bourgeois illusions... Events should not be anticipated. Time is on our side. This was what many in the Bolshevik Party overlooked. Burning with desire to rid themselves of the class enemy they did not see that subjective will was not a sufficient condition for the victory of the working class. …for our party to have broken with the spontaneous movement of the Kronstadt masses would have struck an irreparable blow to its authority. On the other hand, an armed uprising would have been doomed to certain defeat. We might have seized power with comparative ease but would not have been in position to retain it. Mistakes are inevitable when the masses are fighting but the communist remain with the masses, see these mistakes, explain them to the masses, try to get them rectified and strive perseveringly for the victory of class consciousness over spontaneity. This is perhaps the most fitting epitaph for the episode. The July Days showed that even a against a bourgeoisie which was as weak, fragmented and politically bankrupt as that in Russia in 1917, the working class cannot overthrow it without uniting all its forces in apolitical instrument to lead that struggle, i.e. the political party. The Soviets though the expression of the class-wide movement of the working class are not the instrument for the assault on bourgeois state power since, as the experience of July shows, they contain elements which support that power. It was not the Provisional Government which was able to call up the troops which carried out the repression against the workers who took part in the July Days. It was the Menshevik/S.R. Executive of the Petrograd Soviet. Despite being an enormous setback in the short-term for the Bolsheviks, the July Days also emphasized the proletarian nature of Bolshevism against the majority parties in the Soviet. This was further underlined in the days which followed July. By circulating the lie that Lenin was a German spy and the Bolsheviks were paid by the Germans to disrupt the Russian army, the Provisional Government persuaded many units in Petersburg to return to barracks. At the same time the Provisional Government were not slow to use the support of the Executive Committee of the Soviet in bringing back from the front troops loyal to the war effort. By the time Pravda announced the end to the demonstrations on July 5th the repression had already began. The Pravda offices were seized and its printing presses smashed (Lenin having left shortly before the detachment from the Government arrived), the arrest of Lenin, Kamenev and Zinoviev was ordered, hundreds of Bolsheviks were rounded up, and there were a number of lynchings of Bolsheviks. All kinds of reactionaries now crawled out of the woodwork to participate in the Bolshevik-baiting. In this they were egged on by the Menshevik leaders in the Provisional Government, Tsereteli and Dan, who even ordered the closing down of a Menshevik newspaper (Novaya Zhizn) run by Gorky! This only added to the attacks on workers and soon the Mensheviks and S.R.’s themselves were under attack from the anti-semitic and proto-fascist Black Hundreds that had been one of the instruments of terror used against workers under the Tsars. This blatant reaction however only served to underline to the working class the proletarian nature of the Bolshevik Party. In fact, though the Bolsheviks went through a temporary crisis of confidence in which some of their supporters in the factories dissociated themselves for a time from the Central Committee, and even put themselves under the control of the Executive Committee of the Soviet, within a fortnight the worst was over. Given the bourgeoisie’s murderous intentions and their belief that “The Bolsheviks are destroyed...” at this time, it is remarkable that the Bolsheviks were able to survive at all. The main reason lies in their support amongst the masses which, though wavering at the edges during the repression, never cracked. The Bolsheviks for had too long championed proletarian interests, particularly in the antiwar struggle, for the masses to abandon them now. Equally the government blamed the July Days on the Bolsheviks alone but within the working class heartlands of Petersburg their suppression by a reactionary government for staying with the masses ultimately confirmed their support amongst the working class. Thus most of the 32,000 Bolsheviks in Petersburg were able to take refuge in the Vyborg and other working class districts where the Government forces dared not go. Although many factories were raided for weapons, few were found, and Kerensky (who became Prime Minister on July 7th) knew that it would risk full-scale civil war to try to go further. In addition the Soviet leaders were cautioning a halt to the repression since its reactionary nature was bound to help the proletariat see even more clearly that the Bolsheviks were the only genuine proletarian force in Russia at the time. The feebleness of the repression against the Bolsheviks can be gauged by the fact that only one of the Central Committee was imprisoned (Kamenev) and though Lenin and Zinoviev remained in hiding until October they were still able to take part in Party debates. As early as July 7th the Petersburg Committee were able to issue leaflets again and membership not only did not fall but was once again rising as soon as the skeleton of the Party apparatus was reorganised. On July 26th “in a spacious private assembly hall in the heart of the Vyborg District”, the Bolshevik Party’s Sixth Congress opened and continued, unmolested, to debate the new course for the Party for five days. The Party had already learned the need for greater centralisation within its own ranks and the Military Organisation was put under closer supervision by the Party. Its paper was taken over by the Central Committee to replace Pravda and its leaders criticised for their adventurism during the July Days. The main topic on the agenda of the Sixth Congress was, however, the next step for the working class. Supporters of Lenin were circulating a text called “On Slogans”. The main thrust of this was to say that the July Days had shown that a peaceful development of the revolution was no longer possible. It was no good hoping for the Soviets to simply replace the Provisional Government since the S.R./Menshevik leaders of the Soviets were hopelessly committed to the bourgeoisie. This point was fully shown by their support for Kerensky’s repression against the working class instead of taking the power which the July demonstrators knew was there for the taking. From this Lenin concluded it was no point calling for “All Power to the Soviets” since it was clear that the Soviet actually was the biggest obstacle to this. To all kinds of liberals, reactionaries and formalists Lenin’s wish to drop the slogan is enough to confirm them in their belief that the Bolsheviks did not really believe in the soviets as forms of proletarian democracy. Peaceful development would then have been possible, even in the sense that the struggle of classes and parties within the Soviets could have assumed a most peaceful and painless form, provided full state power had passed to the Soviets in good time. Soviets may appear in this new revolution, and indeed are bound to, but not the present Soviets, not organs collaborating with the bourgeoisie, but organs of revolutionary struggle against the bourgeoisie. It is true that even then we shall be in favour of building the whole state on the model of the Soviets. It is not the question of Soviets in general, but of combatting the present counterrevolution and the treachery of the present Soviets. ... power is in the hands of a military clique of Cavaignacs (Kerensky, certain generals, officers etc.) who are supported by the bourgeois class headed by the Kadet Party. Cavaignac was the general who had butchered the Parisian workers in June 1848. The Russian bourgeoisie thought they had found their Cavaignac a month later in the person of General Kornilov. He was to provide the Bolsheviks with their third major test of 1917.